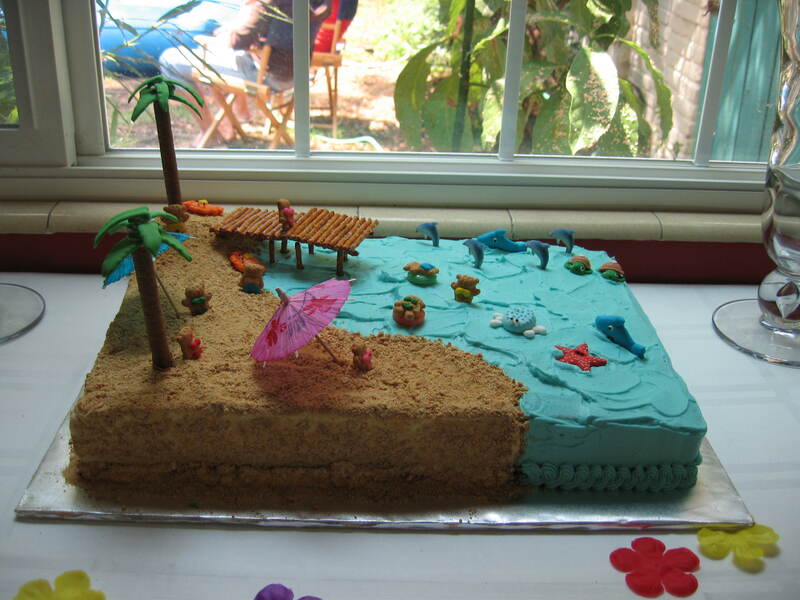 I made a cake with a beach scene for a friend’s daughter’s 6th birthday party using a full sheet cake pan. I made a chocolate cake with buttercream icing, half tinted with aqua food coloring. This was also in June, probably my most busiest cake month! The birthday girl loved it nonetheless and even helped decorate her cake by placing the sea creatures where she wanted them to be. We absolutley loved this cake. DD is trying to make something similar for her 4-H cake. Do you have any suggestions for her to get the graham crackersto stick to the sides? Any help would be very appreciated. Do you mean after they are crushed to look like sand? If so, then press the graham cracker crumbs onto the sides of the cake soon after it is frosted, before the frosting “hardens”. The frosting is a good glue to get the graham cracker crumbs to stick to it. If, however, you are referring to using graham crackers for the pier, you can use melted chocolate or cookie icing to glue them together. To support them, you can you pretzel sticks or pocky sticks underneath. Trying to make palm trees with royal icing for my twins beach cake. How did you form the leaves? Did you pipe them with a tip over something to give them shape? And did you pipe each one individually and then attach them together with r.i.? and lastly did you pipe the teddy grahams with royal icing too? Thank you!!!! Yeah! I hope your twins like the cake! For the palm trees, I used royal icing with the “leaf” piping tip (I forget the tip number). I piped the palm leaves side by side on a strip of wax paper and then place the wax paper on top of a curved surface, like a pvc pipe or boom whackers (kids toy). I would use a large diameter pipe to form the curves, if you use a smaller diameter pipe, then pipe thinner leaves so they balance better on your piroline sticks. I place the longer leaves on the pirolines first and use the shorter leaves for the top because it balances better, i.e., the leaves won’t fall off. I use regular frosting to hold the leaves onto the pirolines because royal icing takes too long to “set”. Then again, you can use a thicker version of the royal icing (like that used for gingerbread houses) so it “sets” faster. Hope this helps! Please send a link to your beach cake! I’d love to see it! Yes, for the teddy grahams, I piped them with royal icing as well, using a small open tip, like #2. So sorry for the late reply! I just started a new job and have been busy to the gills! I think either brown sugar or crushed graham crackers will work well for the sand. I prefer to use the graham crackers because it is not as sweet as pure sugar. Thanks! I’m so happy you like it! Please send a pix for the cake you make on your birthday. I’d love to see it! I used your idea for my daughter’s first birthday cake today and It WAS AWESOME!!! Thanks!!! Mine was a little different but I would like to show you. I’m glad you tried it! Yes, please send me a pix of how it turned out. I’d love to see it! Making this cake ! Ready to frost it tomorrow…. will let you know how it turns out- my kiddo will be 9 and thanks for posting this cake, she found it on her own…..online….so thanks. I’m curious as to what size sheet pan you used. You had plenty of room for decoration on yours, I don’t want to end up having to cram things on. I don’t really remember, but I did put in the blog a full sheet, so I must have used a 18×14 pan. Another thing I do sometimes is bake two 9×13 pans and just put them side by side. You can’t tell w/ the frosting! Hope this helps and let me know how it turns out! Thanks for the link to my blog! Thanks also for linking to your finished cake. I think it looks great and I hope you had a lot of fun! Hi! I love your cake design. 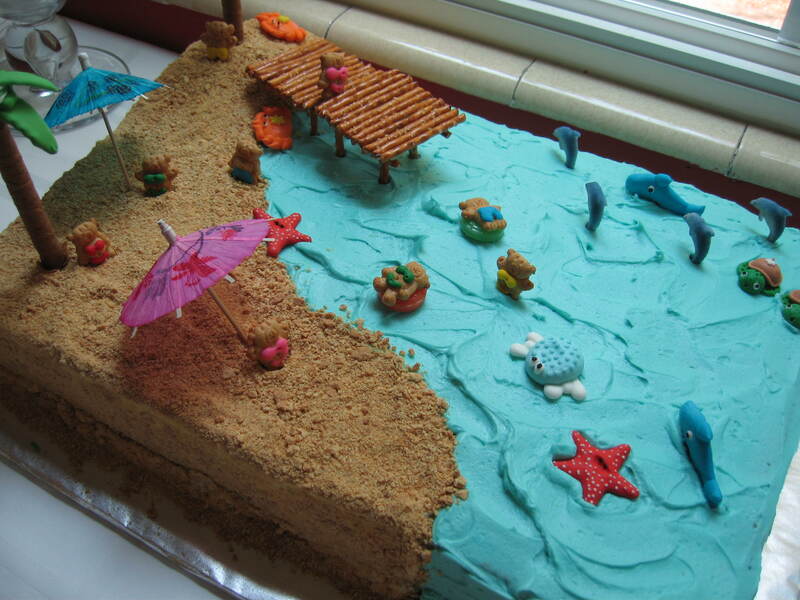 I have a beach themed party coming up and would love to make a cake like this. Except for the creatures I have most the “ingredients”. How did you make the warf? i have pretzels but wasn’t sure how to “stick” them together in the same manner you did. Any suggestions? Thanks. For the wharf, I glued the pretzel sticks together using royal icing. I had tried using chocolate before but that didn’t glue it as strongly as the royal icing. Use a thicker royal icing so it’s easier to stick the pretzels together. Good luck and have fun! Hope it all works out and send me pix if you can…would love to see it! I’m having my daughter’s 2nd birthday party Saturday! I am doing this cake and I’m so excited!! 🙂 I attempted a few royal icing things about a month ago but they didn’t turn out and they broke too. I am just going to use some plastic sea creatures. Will buttercream frosting be ok to use as a glue for the pier and also the teddy grahams suits? Thanks! LOVE your cake!! So sorry! I’m so behind on my blog and haven’t checked until recently. I hope your cake turned out beautifully…I’m sure it did. For future reference, white chocolate is probably better than milk chocolate. Milk chocolate melts easily whereas white does not. If your royal icing is not holding up, use less water in your royal icing to make it less watery. Piping it will be tougher, but it will dry faster and hold the pretzels in place better. I think adding cream of tarter can also help (I remember reading that somewhere, to make icing for gingerbread houses), but I can’t remember where I saw that. You can try googling it. As for the clothes on the bears, regular frosting should work, but it can smudge more easily since it doesn’t really harden. So long as you don’t handle the bears too much after piping their clothes on, it should be okay. Hope that helps and again, so sorry for the delay! Please send a pix of your cake if you can. Would love to see it! how did you make the sea creatures? did you use royal icing, or fondant? I used royal icing. Lately, though, I’ve been using softened tootsie rolls and starbursts to make small things. I think do what you feel most comfortable with. Good luck and send me a pix as I’d love to see it! adorable cake! a customer spotted it so I am recreating it! I love the teddy beach goers!! I hope I’m not too late in answering your question! Good luck w/ the cake! 1. You can make the cake 1 day ahead. I would recommend covering your cake with plastic wrap very well when storing in the refrigerator. It helps to keep the cake moist prevents it from getting dry. It also makes it easier to frost the cake, so there is less crumbs! 2. You can crush the graham crackers in advance. Just keep in a ziploc back for freshness. 3. You can decorate the teddy grahams w/ the royal icing in advance. Once the royal icing dries, just store the teddy grahams in a ziploc bag. 4. You can make the royal icing in advance as this keeps at room temperature very well. Do not use raw egg whites for the royal icing. Use the powdered egg whites instead. 5. You can make the frosting in advance. Just cover the bowl very well so the frosting does not dry out in the refrigerator. Before frosting the cake, take the frosting out of the fridge so it warms up a little. It will help make frosting the cake easier w/ less crumbs if the frosting is warm and more spreadable. If you try to frost the cake w/ cold frosting, it might tear chunks out of the cake and cause more crumbs to get on the frosting, which doesn’t look as nice. 6. You can make the pretzel pier in advance. Just store them in a cool dry place in a ziploc bag. 7. You can make the sea creatures and palm leaves also in advance. Just place them in a tupperware after they have fully dried after you have piped them. I would not recommend making the palm trees in advance as these are pretty fragile. I usually save them for last and sometimes make them once the cake is settled into the final location. I think this can survive a hot day pretty well if you decorate the cake and leave in the fridge for 2-3 hours before the party in the sun. It helps to have the cake in the shade. If the cake is cool because you made it in advance and stored in the fridge, then I think this cake will do well in the heat, but not for long hours in the heat. Hello, I’m using wordpress.com as the blog hosting site. Hi, I want to make this cake this weekend, it is so beautifull! Do you really have made all the sea creatures with royal icing? if so, how did you do that? with tip or mold? Thanks again for this great idea. Yes, I made the creatures w/ royal icing. It is a pain to make the colors and put into piping bags, but once that is done, it becomes fun. 🙂 I used different tips to make the creatures. You can experiment! I think the dolphins I bought online somewhere. They are made out of pressed sugar I believe. Do you know if I can use fondant for the sea creatures? Will it melt when I’ll put them on the buttercream frosting? Sorry for the late reply! I hope it turned out well, let me know! I think you can use fondant for the sea creatures, but make sure you dry it out well. I don’t think it will melt on the buttercream frosting, but the colors may bleed. I’m not as familiar w/ fondant, so sorry I can’t be much help here! I’m happy you can share making a beach cake with your grand daughter! Have fun! Those are some suitable on the lookout birthday cake tips. Will follow-up and try towards bake a single at home. I which include in direction of be artistic. Thanks.